It was one definitely a weird challenge to take a “flat” map of something on a sphere and project it onto a smaller sphere. Got mindfucked a few times along the way. 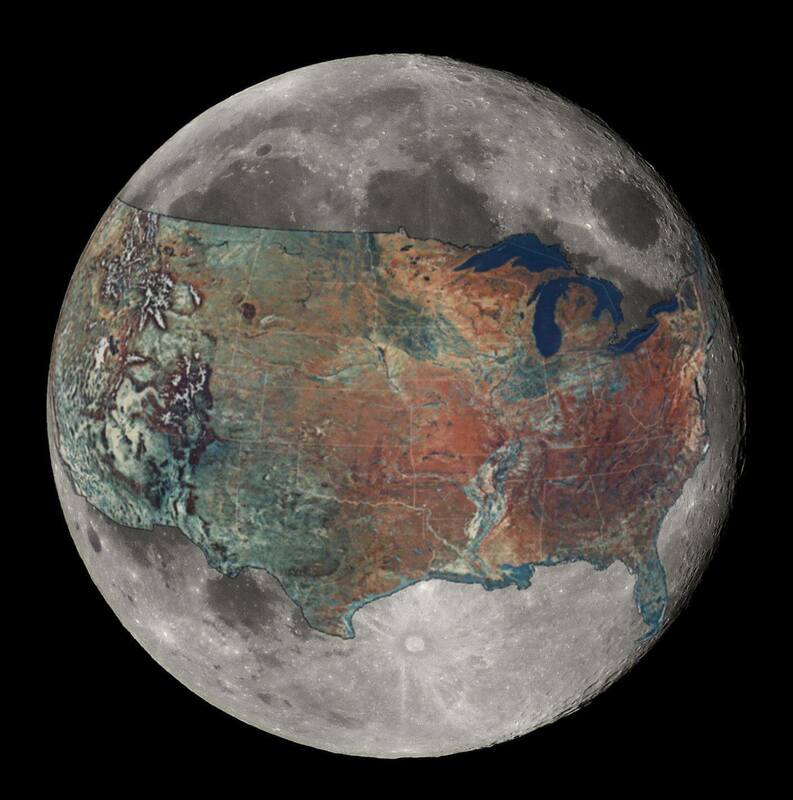 Certainly take it only as an approximation, but what intrigued me the most is that the distance spanning the continental United States is roughly equal to a little less than half the circumference of the moon. It’s strange — when we imagine objects in our solar system (even ones we know to be “small,” relative to other celestial bodies) I suspect that many of us regard them as just being unrelatably huge. They exist at scales so large, and at distances so vast, that numbers relating to mass, surface area and volume — descriptive though they may be — are rendered effectively meaningless. So it’s always nice when images like this come along that help put things into perspective, whether it’s a side-by-side comparison of all the water on Earth relative to the Earth itself, a figure illustrating there’s more water on Jupiter’s moon Europa than there is on Earth, or a map of the U.S. slapped across the Moon’s near-side. * It’s 2,901 miles from CA’s North Farallon Island to ME’s Sail Rock, which is located a few hundred yards beyond the Easternmost short of Quoddy Head, though whether these points are, in fact, “contiguous” with The Contiguous United States basically boils down to semantics.